For other uses, see Florida panther (disambiguation). The Florida panther is a North American cougar P. c. couguar population. In South Florida, it lives in pinelands, hardwood hammocks, and mixed swamp forests. 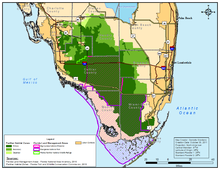 Development and the Caloosahatchee River are major barriers to natural population expansion. While young males wander over extremely large areas in search of an available territory, females occupy home ranges close to their mothers. For this reason, panthers are poor colonizers and expand their range slowly despite occurrences of males far away from the core population. The Florida panther has low genetic diversity due to a variety of environmental and genetic factors. Factors that include habitat destruction contributed to the formation of a distinct and isolated subspecies of puma in the Florida panther. Isolation was followed by a gradual decline in the population size that increased the likelihood of inbreeding depression. The lower genetic diversity and higher rates of inbreeding led to the increased expression of deleterious traits in the populations, resulting in lower overall fitness of the Florida panther population. This also lowers the adaptive capacity of the population and increases the likelihood of genetic defects  such as cryptorchidism and other complications to the heart and immune system. Specifically concerning the Florida panther, one of the morphological consequences of inbreeding was a high frequency of cowlicks and kinked tails. 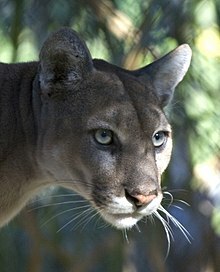 The frequency of exhibiting a cowlick in a Florida panther population was 94% compared to other pumas at 9%, while the frequency of a kinked tail was 88% as opposed to 27% for other puma subspecies. To increase genetic diversity of the Florida panther, eight Texas pumas were introduced to the Florida population to hopefully promote the survival of the native population. The results indicated that the survival rates of hybrid kittens were three times higher than those of purebred pumas. Due to the successes of this restoration effort, the genetic depletion of the Florida panther population is now not as much of a problem as it used to be, but ought to be monitored since the population is still in a fragile state. ^ a b Kitchener, A. C.; Breitenmoser-Würsten, C.; Eizirik, E.; Gentry, A.; Werdelin, L.; Wilting, A.; Yamaguchi, N.; Abramov, A. V.; Christiansen, P.; Driscoll, C.; Duckworth, J. W.; Johnson, W.; Luo, S.-J. ; Meijaard, E.; O’Donoghue, P.; Sanderson, J.; Seymour, K.; Bruford, M.; Groves, C.; Hoffmann, M.; Nowell, K.; Timmons, Z.; Tobe, S. (2017). "A revised taxonomy of the Felidae: The final report of the Cat Classification Task Force of the IUCN Cat Specialist Group" (PDF). Cat News. Special Issue 11: 33−34. ^ "Florida Panther General Information". Florida Panther Society. Retrieved 2010-12-24. ^ "msnbc.com Video Player". MSNBC. Retrieved 2011-10-13. ^ a b Wozencraft, W.C. (2005). "Order Carnivora". In Wilson, D.E. ; Reeder, D.M (eds.). Mammal Species of the World: A Taxonomic and Geographic Reference (3rd ed.). Johns Hopkins University Press. pp. 544–545. ISBN 978-0-8018-8221-0. OCLC 62265494. ^ WEC 167/UW176: Jaguar: Another Threatened Panther. Edis.ifas.ufl.edu. Retrieved on 2012-05-02. ^ PantherNet : Handbook: Natural History : Physical Description. Floridapanthernet.org. Retrieved on 2012-05-02. ^ Bartareau, Tad; Onorato, Dave; Jansen, Deborah (March 2013). "Growth in body length and mass of the Florida panther: An evaluation of different models and sexual size dimorphism". Southeastern Naturalist. 12 (1): 27–40. doi: 10.1656/058.012.0103. ^ "Florida Panther". Endangered and Threatened Species of the Southeastern United States (The Red Book). U.S. Fish and Wildlife Service. 1993. Archived from the original on July 6, 2007. Retrieved 2007-06-07. ^ Culver, M.; Johnson, W.E. ; Pecon-Slattery, J.; O'Brein, S.J. (2000). "Genomic Ancestry of the American Puma" (PDF). Journal of Heredity. 91 (3): 186–197. doi: 10.1093/jhered/91.3.186. PMID 10833043. Archived from the original (PDF) on 2007-06-16. ^ The Florida Panther Recovery Team (2006-01-31). "Florida Panther Recovery Plan (Draft)" (PDF). Vero Beach, FL, US: U.S. Fish and Wildlife Service. Archived from the original (PDF) on 2008-04-21. ^ Maehr, David S.; Land, E. Darrell; Roof, Jayde C.; Mccown, J. Walter (1989). "Early Maternal Behavior in the Florida Panther (Felis concolor coryi)". American Midland Naturalist. 122 (1): 34–43. doi: 10.2307/2425680. JSTOR 2425680. ^ Kilgo, J. E. (1998). "Influences of Hunting on the Behavior of White-Tailed Deer: Implications for Conservation of the Florida Panther" (PDF). Conservation Biology. 12 (6): 1359–1365. doi: 10.1046/j.1523-1739.1998.97223.x. ^ McBride, Roy; McBride, Cougar (December 2010). "Predation of a Large Alligator by a Florida Panther". Southeastern Naturalist. 9 (4): 854–856. doi: 10.1656/058.009.0420. ^ a b c Maehr, David S.; Deason, Jonathan P. (2014). "Wide-ranging carnivores and development permits: constructing a multi-scale model to evaluate impacts on the Florida panther". Clean Technologies and Environmental Policy. 3 (4): 398–406. doi: 10.1007/s10098-001-0129-4. ^ a b Benson, John F.; Lotz, Mark A.; Jansen, Deborah (February 2008). "Natal Den Selection by Florida Panthers". Journal of Wildlife Management. 72 (2): 405–410. doi: 10.2193/2007-264. ^ Maeher, D.S. ; Land, E. Darrell; Roof, Jayde C.; McCown, J. Walter (July 1989). "Early maternal behavior in the Florida panther". The American Midland Naturalist. 122 (1): 34–43. doi: 10.2307/2425680. JSTOR 2425680. ^ Sivlerstein, Alvin (1997). The Florida Panther. Brooksville, Connecticut: Millbrook Press. pp. 41+. ISBN 978-0-7613-0049-6. ^ "The Florida Panther". Sierra Club Florida. Retrieved 21 June 2013. ^ "BACK TO THE WILD". Friends of the Florida Panther Refuge. Retrieved 21 June 2013. ^ Staats, Eric (23 September 2011). "Orphaned Florida panther kittens rescued". Naples Daily News. ^ Fleshler, David (3 April 2013). "First Florida panther released into Palm Beach County". Sun Sentinel. ^ Staats, Eric (January 27, 2004). "Sierra Club Says Ave Maria Will 'Threaten' Everglades". Naples Daily News. Retrieved 2009-10-18. ^ Schwab, Autumn; Paul Zandbergen (April 2011). "Vehicle-related mortality and road crossing behavior of the Florida Panther". Applied Geography. 31 (2): 859–870. doi: 10.1016/j.apgeog.2010.10.015. ^ Miller, D.L. ; Taylor, Rotstein; Pough, Barr (April 2006). "Feline Immunodeficiency Virus and Puma Lentivirus in Florida panthers (Puma concolor coryi): Epidemiology and Diagnostic Issues". Veterinary Research Communications. 30 (3): 307–317. doi: 10.1007/s11259-006-3167-x. PMID 16437306. ^ Cunningham, Mark W.; Brown, Meredith A.; Shindle, David B.; Terrell, Scott P.; Hayes, Kathleen A.; Ferree, Bambi C.; McBride, R. T.; Blankenship, Emmett L.; Jansen, Deborah; Citino, Scott B.; Roelke, Melody E.; Kiltie, Richard A.; Troyer, Jennifer L.; O'Brien, Stephen J. (July 2008). "Epizootiology and Management of Feline Leukemia Virus in the Florida Puma". Journal of Wildlife Diseases. 44 (3): 537–552. doi: 10.7589/0090-3558-44.3.537. PMC 3167064. PMID 18689639. ^ Facemire, Charles; Gross, Guillette (May 1995). "Reproductive Impairment in the Florida Panther: Nature or Nurture?". Environmental Health Perspectives. 103 (Supplement 4): 79–86. doi: 10.2307/3432416. JSTOR 3432416. PMC 1519283. PMID 7556029. ^ a b Pimm, S. L.; Dollar, L.; Bass, O. L. (2006-05-01). "The genetic rescue of the Florida panther". Animal Conservation. 9 (2): 115–122. doi: 10.1111/j.1469-1795.2005.00010.x. ISSN 1469-1795. ^ Kardos, Marty; Taylor, Helen R.; Ellegren, Hans; Luikart, Gordon; Allendorf, Fred W. (2016-12-01). "Genomics advances the study of inbreeding depression in the wild". Evolutionary Applications. 9 (10): 1205–1218. doi: 10.1111/eva.12414. ISSN 1752-4571. PMC 5108213. PMID 27877200. ^ a b Land, Darrell; Lotz (1996). "Wildlife Crossing Designs and Use by Florida Panthers and Other Wildlife in Southwest Florida" (PDF). Trends in Addressing Transportation Related Wildlife Mortality. p. 323. ^ Florida Panther Recovery Plan Archived 2006-10-02 at the Wayback Machine. 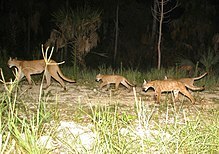 The Florida Panther Recovery Team, South Florida Ecological Services Office, U.S. Fish and Wildlife Service. Published 1995-03-13. Retrieved 2007-01-30. ^ Kautz, Randy (June 2006). "How much is enough? Landscape-scale conservation for the Florida panther". Biological Conservation. 130 (1): 118–133. doi: 10.1016/j.biocon.2005.12.007. ^ Pittman, Craig (December 18, 2008). "Florida panthers need new territory, federal officials say". Tampa Bay Times. St. Petersburg, FL. Retrieved 2013-08-20. ^ Onorato, D. P.; Criffield, M.; Lotz, M.; Cunningham, M.; McBride, R.; Leone, E. H.; Bass, O. L.; Hellgren, E. C. (April 2011). "Habitat selection by critically endangered Florida panthers across the diel period: implications for land management and conservation". Animal Conservation. 14 (11): 196–205. doi: 10.1111/j.1469-1795.2010.00415.x. ^ Gross L (2005). "Why Not the Best? How Science Failed the Florida Panther". PLoS Biol. 3 (9): e333. doi: 10.1371/journal.pbio.0030333. PMC 1188244. PMID 16108700. ^ Beier, P; Vaughan, MR; Conroy, MJ and Quigley, H. 2003, An analysis of scientific literature related to the Florida panther: Submitted as final report for Project NG01-105, Florida Fish and Wildlife Conservation Commission, Tallahassee, FL. ^ Beier, P; Vaughan, MR; Conroy, MJ; Quigley, H (2006). "Evaluating scientific inferences about the Florida panther" (PDF). Journal of Wildlife Management. 70: 236–245. doi: 10.2193/0022-541x(2006)70[236:esiatf]2.0.co;2. ^ Conroy, MJ; P Beier; H Quigley & MR Vaughan (2006). "Improving the use of science in conservation: lessons from the Florida panther" (PDF). Journal of Wildlife Management. 70: 1–7. doi: 10.2193/0022-541X(2006)70[1:ITUOSI]2.0.CO;2. ^ Information Quality Guidelines: Your Questions and Our Responses. U.S. Fish and Wildlife Service. Published 2005-03-21. Retrieved 2007-01-30. 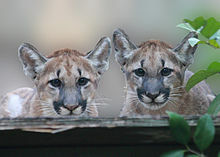 ^ Fish and Wildlife Service releases Draft Florida Panther Recovery Plan for public review. U.S. Fish and Wildlife Service. Published 2006-01-31. Retrieved 2007-01-30. Wikimedia Commons has media related to Puma concolor coryi.